If you're old enough, you may have watched the animated series Voltron way back in the day and as kids, we didn't mind what it was. Come on, giant lion robots that form one big robot to beat up evil, in every single episode. In this new version of Voltron, we have a very different animated story that's being told. It borders on a mature telling of this magically enhanced lion creations of technology, but the story is totally about the Paladins, the pilots of the lions. 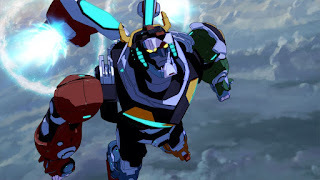 The show doesn't focus on forming the giant robot every episode, but rather, on the challenges that the Paladins face themselves and every now and then, we see Voltron itself. We learn about the characters, the background of the different alien species, the familial issues within the alien species or enemies... there's a lot to learn. Not biased, nope, not at all, but for an animated series, it was surprising that in between some of the quirky humor pointed at kids, there was a good story in there. Don't believe me? It has an 8.3/10 on IMDb.